Faithful collaborator of God, the Holy Virgin has always used the most humble souls to communicate her messages to mankind. What about, indeed, the complicated “wisdom” of the world’s leaders in the presence of the ineffable simplicity of the heavenly words? Only a soul that has not repudiated its first candour or that has found it by grace could understand their intimate and luminous meaning. It is to one of these souls that the Holy Virgin entrusted last century a mission that did not end with the death of the one who has received it, but that we have to carry on. Saint Catherine Labouré, to whom Our Lady revealed a great mission, was born on May the 2nd 1806 in Fain-les-Moutiers, “grove of trees and houses” located in the Burgundian countryside. At the age of 9 years and half, Catherine lost her mother. It was at this time that the Holy Virgin’s first intimate appeal resounded in her soul; with all the fervour of her very pure heart, the child turned to Mary remained her only mother. The Holy Virgin took her under her protection to take her to Jesus, by the way of a devotion which would have led her, during a life pervaded with an exceptional fidelity, to the peak of the perfection. At the age of 12, Catherine made her first communion, devoting her life to Jesus as can do just those, whom God’s unfathomable plans have prepared, from the beginning, to love Him above all. Her adolescence was really marked by this gift of herself made to the unique Master; her devotion, her spirit of penitence, her imitation of Jesus did not escape her attendants. This child of 12 years, promoted by tragic circumstances to the rank of the lady of the house, would have led up to 18 years, in despite of the difficulties presented by the management of a farm, a true religious life, with its alternations of work, penitence and prayer. The father was satisfied with the good course of the house without wondering which source this child drew the energy of all the dedications from. Towards the age of 18 years, an extraordinary fact – that she will call a dream, at the end of her life – revealed her the orientation of her destiny, at the service of the sick persons, among the Daughters of the Charity of Saint Vincent de Paul. At her majority, Catherine revealed her father her desire of the religious life. The father refused his assent: he needed Catherine…and Catherine was his favourite daughter… He sent her to Paris, where the elder brother ran a tavern for workers with his wife; the hope of seeing dying in such environment his daughter’s ideas of convent gave to Pierre Labouré the courage to separate from his child. Indeed Catherine remained pure and faithful, steadfast in her resolution. Then they tried to put her in a boarding school for young ladies, owned by her sister-in-law, but this more or less frivolous environment contrasted with the simplicity of her tastes and aspirations. This stay to Châtillon-sur-Seine was worth her the grace to clarify her vocation by the more intimate acquaintance she made of the Sisters of the Charity. Matured by the trials and the difficulties, Catherine was finally able to answer the appeal of the Lord: she entered the Seminary of the Daughters of the Charity of Saint Vincent de Paul, on April the 11th, 1830, after a 3 months postulate. It was there, at the rue du Bac in Paris, that the Holy Virgin was waiting for her child. During the night between the 18th and the 19th of July 1830, Sister Catherine heard herself being called thrice by her name. She moved the curtain of her cell aside and saw in front of her a young child of 4 to 5 years of age, dressed in white, shining of light. “Come to the chapel, he said, the Holy Virgin is waiting for you”. Catherine was afraid: “But they will hear me!”. The child reassured her and took the young novice to the chapel where all the candles and the torches were lighted. Catherine knelt down in the sanctuary… Suddenly, she heard something like the rustle of the silk; the child said her: “Here is the Holy Virgin”. Catherine did not know how long she had stayed at the feet of the Virgin. The child took her to her cell. “I believe”, she said, “this child was my guardian angel who had become visible to let me see the Holy Virgin because I had prayed him a lot so to get this favour”. On Saturday November the 27th 1830, towards the evening, Sister Catherine was kneeling down in the chapel. Suddenly, she heard the sweet rustle of a silk garment; she raised the eyes: the Holy Virgin was there, all dressed in white, in an indescribable beauty. The head was covered with a glittering white veil, coming down up to the feet. She was staying on a ball which Catherine saw only a half of, trampling a snake and holding in her hands a smaller ball. While she raised this last to the sky, her face became even more beautiful; then, the ball disappeared, the arms remained outstretched in the attitude popularized by the Miraculous Medal. Her fingers became covered with precious stones which cast rays of light: “this ball you see”, the Holy Virgin said, “represents the whole world and each person in particular… these rays are the symbol of the graces I spread on the people who ask for them…the stones which cast no rays symbolize the graces that one neglects to ask for”. At this moment it appeared around the apparition “a little bit oval picture” where the following words were written in golden letters: “Oh Mary, conceived without sin, pray for us who had recourse to You”. At the same time Chaterine received the following communication: “Let strike a medal on this model; all people who will wear it will receive great graces; the graces will be abundant for the people who will receive it faithfully”. Then the picture turned itself, showing in its reverse the letter M overlapped with a cross having a at its base a bar, Jesus’ Heart surrounded by a crowns of thorns and Mary’s Heart pierced by a sword. All around a crown of twelve stars shone. Father Aladel, Sister Catherine’s confessor, examined with the care and the prudence the Saint Church requires the Sister’s declarations, and appeared at first very reserved. Sister Catherine’s attitude, her exemplary life and her complete submissiveness to her confessor reflected her sincerity beyond suspicion. Father Aladel waited until the beginning of 1832 to speak to the archbishop of Paris, Monsignor de Quelen, of the apparitions of Rue du Bac and of the complaints addressed by the Holy Virgin to Catherine, because the Medal has not been struck yet. The Archbishop then recommended to strike the Medal. Catherine’s joy was very deep when Father Aladel handed her the Medal. She took it with respect, kissed it and said: “Now, it is necessary to spread it. As it will be beautiful to hear people say: ‘Mary is the queen of the universe’. It will be a time of peace, joy and happiness”. Now, Saint Catherine Labouré knew that Mary’s promise came true and that a river of graces spilt on those who wore the Medal faithfully. The first Medals were blessed by the Archbishop himself, to whom God granted the grace to be witness of the first miracle. Monsignor de Quelen, in fact, presented himself at the door of a man, whose apostasy had made him notorious. He was dying, refusing to reconcile with God. The Archbishop was dismissed. He doubled prayers and faith in the Immaculate’s Medal. During the night, Monsignor de Quelen was called at the death-bed of the one who had denied his faith and his commitments. Touched by the grace, the dying died in peace in the arms of the archbishop of Paris. The rumour of this conversion spread rapidly. Reports of other conversions and extraordinary healings were added to this Mary’s victory, addressed from all sides to the Father archbishop everywhere the suffering was confided to the Immaculate Virgin and to the Medal a heavenly answer attested Mary’s indefectible love and powerful intercession. Soon the believers spoke of the Medal only with the title forged by them of the “Miraculous Medal”. One of the miracle that aroused the greatest deal of interest was the conversion of the Jew Alphonse de Ratisbonne, on the 20th of January 1842. During a trip to Italy, this young israelite stopped off in Rome where he met the baron de Bussieres, a fervent and ardent catholic. Full of compassion for his young friend and pushed by an extraordinary strenght that made him brave in front of all the difficulties, the baron of Bussieres tried to lead Ratisbonne to the knowledge of the truth. The young man answered by joking to all the baron’s attempts. His conclusion was always the same: “I am Jewish and I will dye Jewish”. The baron however got from him that he wore round his neck a Miraculous Medal and that he recited in the mornings and in the evenings the “Remeber”. This prayer became an obsession in this young man’s soul, but the more his friend tried to persuade him of the truth of Christianity, the more Ratisbonne stated his incredulity and even his aversion. A friend of the baron who had promised to pray for this conversion died suddenly, and during the preparations of the funerals in Saint Andrew church, the baron exerted himself to deal with some matters. He was accompanied by Ratisbonne, met “by chance” – we would say “providentially” – along the street and entering the church with him. “I was in the church since an istant”, the converted told, “when all of a sudden I felt seized by an inexpressible perturbation. I raised the eyes; the all building had disappeared to my eyes; one chapel only had, so to say, concentrated the whole light, and in the middle of this rays the Virgin Mary appeared, standing, on the altar, great, brilliant, full of majesty and sweetness, as she is on the Medal; an irresistible strenght pushed me towards her. The Virgin motioned me to kneel, she seemed to tell me: “This is good”!. She didn’t speak to me, but I understood everything”. The conversion of Ratisbonne was instantaneous and perfect. He was conferred the baptism soon and, five years later, having given up the world, he received the ministerial ordination. He died in odour of holiness in 1884. The conversions, healings, extraordinary graces multiplied. The Miraculous Medal spread more and more; at the ends of some months thousands and millions of Medal were struck and sent to the farest countries. Sister Catherine rejoined in the silence and in the retirement. Until her death on the 31st of December 1876, she stayed in the deepest obscurity. Except for her superiors, no one knew Catherine Labourè was the privileged of the apparitions. Monsignor Quelen himself died without having obtained the authorization to see with his eyes the one who had seen the Holy Virgin.On the order of her confessor Sister Catherine had to write down to her superiors different reports about the apparitions. Just after her death, her superiors made the secret of this extraordinary life known. The Saint Church canonized her in 1947. Her corposed is kept intact in the Apparitions chapel in Rue du Bac in Paris. “All people who will wear the Medal will receive great graces. The graces will be abundant for the people who will have faith”. This had been Mary’s promise to Sister Chaterine Labourè. Mary has realized it and she keeps on spilling her graces through us: conversions at all levels of society, healings from all kind of diseases, miraculous help in the greatest difficulties, the worse distresses and even in the dangers of death. Among others the conversion of a lawyer, of a lieutenant general, of a doctor, of a philosopher, of a prince. How many medals, laid by a pious and discret hand under the pillows of dyings rebelled against God, got them the grace of the repentance, of the forgiveness, and of the peace. Mary shows herself by her Medal as the terror of the demon and the victory upon the spirit of evil: “Oh Mary conceived without sin, pray for us who had recourse to You”. So many sick people abandoned to their fate for the impotence of the human science had recovered health in contact with the Miraculous Medal, thanks to the intercession of the one who is really the Safety of the sicks. Among the most prominent events of the history of the Miraculous Medal, it is necessary to give a special place to the institution of the Archconference of Mary’s Immaculate Heart for the conversion of the sinners. After a supernatural intervention, in 1832, the abbot Desgenettes, curate of Notre-Dame des Victoires in Paris, dedicated his parish to Mary’s very Holy and Immaculate Heart. The religious indifference, due to rationalism and immorality, at that time emptied the churches in France. The curate Desgenettes, after long struggles, after years of supplications left without an answer, running out of courage and initiative, finally received the revelation of the infallible mean that would have brought the believers back to his church: “Dedicate your parish to Mary’s very holy and Immaculate heart”. It was the origin of this archconfraternity that, at the death of the curate Desgenettes, counted already more than twenty millions of members. Those who, today, enter the Notre-Dame des Victoires know which graces their souls become impregnated of. The members of this archconfraternity offer to the Immaculate all their acts, their jobs, prayers and repentances and wear the Medal. In 1894, the pope Leon XIII established the feast of the Apparition of the Immaculate Virgin and of the Miraculous Medal, and fixed it on the day of the apparition, November the 27th. We read in the breviary of the feast: “So that the power and the generosity that our merciful Mum testified us through the saint Medal remain always in our memory and that on the same time the devotion of the faithful to the Immaculate Virgin deepen, it seemed good to the Holy See to celebrate every year by a particular solemnity the apparitions of the Immaculate and of her holy Medal”. The triumph of the Miraculous Medal has not ended. On the contrary, it has become even more surprising. The Holy Virgin helps in all the necessities, she keeps on rescuing the sick souls and bodies, she converts the dying through her Medal, as she had promised in the past century. During the last two wars, some soldiers declared to have escaped a certain death, because they wore the Miraculous Medal. Under many bombs, devastating entire regions, some houses containing the Miraculous Medal have been spared with their inhabitants. Some exiles trusting the Medal have found their families again. Mary crosses the world as the Mother of the graces, looking for the revolted and fallen souls with a love of predilection to put them back to the narrow and safe way to the eternal life, or to give them, at the end of a wasted life, the supreme grace of a Christian death. Two great contemporary figures have been branded on this prodigious fresco, two apostles, two servants of the Immaculate: Father Maximilian Kolbe and Father Antonio Ribeiro Pinto. Father Kolbe, Cordelier, is the great apostle of the press and the herald of Mary’s glories, died in the concentration camp of Auschwitz, in 1941, after having offered his life, to save a family man condemned to starve. Real martyr of the love for the neighbours, prepared to this glorious end by a whole life to the service of the Holy Virgin. It is by an existence scattered with prodigies accomplished by the Miraculous Medal: healings, extraordinary conversions, reported in the enthralling book: “Le fou de Notre-Dame”, written by Maria Winowska, Bonne Presse editions, Paris. Father Kolbe called the Immaculate’s Medals his “cartridge against the demon”. Father Antonio Ribeiro Pinto’s life took place in Brazil. Since 1947, one could attend every day an extraordinary spectacle in a village absolutely unknown until then, the village of Urucaina, in the state of Minas in Brazil. The Providence has given this poor village another curate of Ars, in the very moment the church was going to canonize the blessed Catherine Labourè. Unobtrusive and modest as Sister Catherine had been, the good Father Antonio were to become, in the hands of the Queen of the Graces, and admirable instrument of salvation. During his life, Father Antonio has been a faithful and ardent of the very Holy Virgin. Chaplain of a colony for 27 years, in the hinterland of the country, he had to fight against the alcoholism that mastered with all its fatal consequences: immorality, brawls, and especially religious indifference. With a boundless faith, Father Antonio had recourse to the Immaculate Virgin, Mother of all graces, who helped him. To the drinkers he met along the streets, he handed a glass of water he had previously blessed, and in which he had placed the Miraculous Medal, enjoining them to use this mean every time they felt tempted to surrender to the drink. The result was marvellous. After three years this vice had disappeared from the region. All people needing help, the sick, the oppressed, came to ask the Father his blessing. He helped everyone, but what he mainly cared of, was the salvation of the souls. That’s why he advised everyone to lead a Christian life, and to receive more often the sacraments of confession and communion. He said to everyone: “Have a great faith in Mary, Mother of the Graces!”. 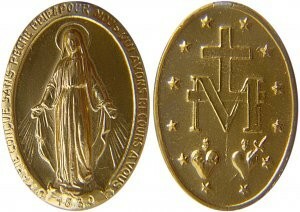 Then he handed them the Immaculate’s Medal recommending them to do a novena to the Mother of the graces. In 1947, quite exhausted, he came back to Urucaina, leaving his parish completely transformed. Indeed people knew how to find him and soon troops of pilgrims went to him. “The one who wants to receive God and Mary’s blessing has not to be God and the Immaculate Virgin’s enemy”. With these words he exhorted the pilgrims to receive the sacrament of confession. In the presence of big gatherings he recited and act of contrition, then the assembly recited three Hail Mary, each followed by the invocation: “Oh Mary, conceived without sin, pray for us who have recourse to you”. He blessed the Medals that would have been distributed afterwards, then he dismissed the people with the blessing. Mary accomplished miracles of conversions and healings by her faithful servant and apostle of the Miraculous Medal. Everywhere the promise made to Sister Catherine Labourè came true: “All people who will wear the Medal will have great graces; graces will be abundant for those who will have faith”. 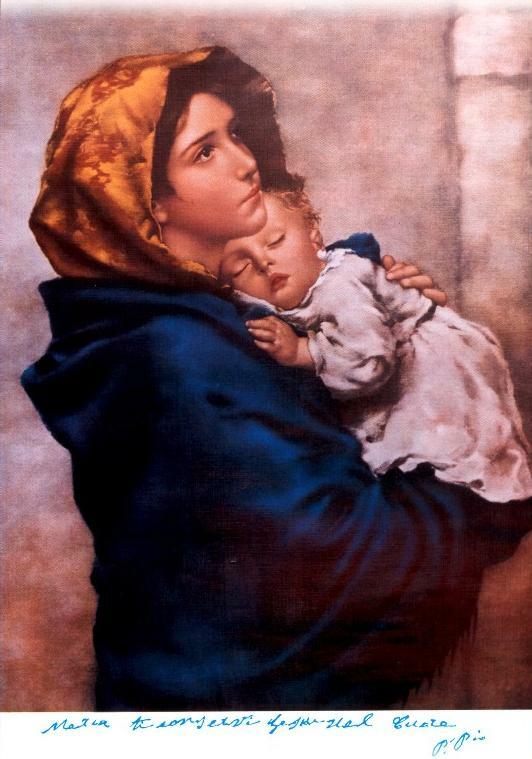 Copyright © 2018 Site dedicated to Mary, the mother of Jesus. All rights reserved.